On Monday, April 24, student activists and members of the United Student-Labor Action Coalition (USLAC) protested the hiring practices of the company who will manage the University’s new bookstore, R.J. Julia Booksellers. Students met with R.J. Julia representatives and Wesleyan administrators to discuss the University’s role in managing the transition for employees of Broad Street Books. Assembling outside of North College, a coterie of students of all years rallied to support Broad Street workers, who they believe have been mistreated by the University, R.J. Julia, and Follett, Broad Street’s parent company. Speaking with representatives from R.J. Julia, the students reiterated their three principle demands: That the new bookstore ensures all current bookstore workers keep their jobs, that all returning workers receive wages equal to or higher than their previous wages, and that R.J. Julia cease to intimidate workers who speak out. Student organizers led the crowd in a series of chants, which included “Fair wages! Fair work!,” “No intimidation, no fear! Workers must be respected here!,” and “We’ll be out here every day, until you let the workers stay!” Fifteen minutes into the protest, a fire alarm began ringing, and students proceeded to march to the other side of North College chanting “Whose store? Our store!” as administrators looked on. “The meeting was cut short by the fire alarm going off in North College, an event that disappointed USLAC and the assembled students because it limited what could be discussed in the meeting with R.J. Julia,” USLAC wrote in an official statement after the protest. However, despite the interruption, many of the student protesters were able to go approach R.J. Julia owner and founder Roxanne Coady. 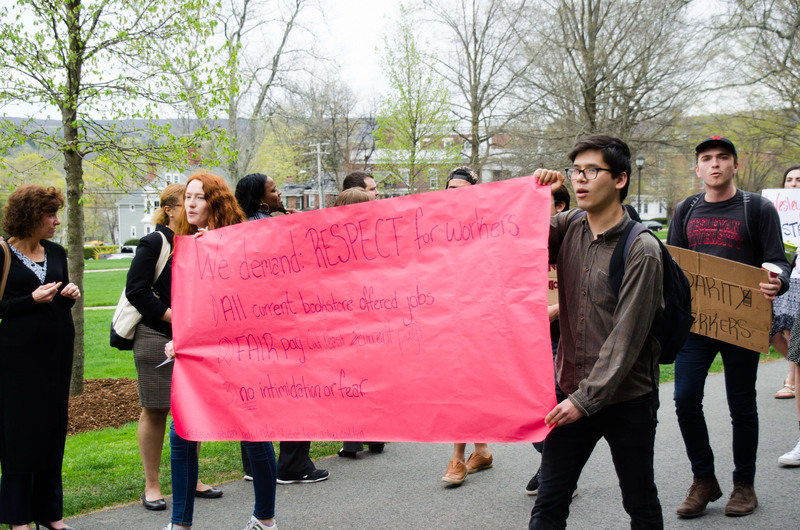 Emma Borzekowski ’19 stood by the front of the crowd, calling students forward to voice their concerns with R.J. Julia’s management decisions. One student spoke about their frustration over R.J. Julia’s hiring policies, especially in the context of the values held by University students who belong to organizations like USLAC. At one point Sokolov asked Coady if she was only interested in the experience of the customers, which Coady denied. Borzekowski ended the portion of the protest in which students voiced their thoughts to Coady by presenting her with a letter voicing more concerns with the new bookstore. After The Argus published “Wesleyan Bookstore Hiring Practice Makes for Turbulent Transition” last week, University Manager of Communications and Public Relations Lauren Rubenstein responded with a series of clarifications rebutting student claims and the testimony of an anonymous Broad Street worker. Rubenstein disputed the accusations that R.J. Julia ever guaranteed Broad Street workers they could keep their jobs (they did grant every employee a chance interview) or offered salaries to Broad Street employees that were lower than what they are currently earning. She also dismissed the idea that Broad Street employees who were told that the new bookstore was looking to cultivate the “R.J. Julia Experience” faced racially discriminatory hiring practices. Finally, Rubenstein stated that Follett had a responsibility to inform Broad Street employees of the University’s decision to open a new bookstore with R.J. Julia next fall. This afternoon, Alec Shea ’18, Communications Director for USLAC, responded to The Argus’ requests with an official USLAC statement in response to Rubenstein’s letter. USLAC’s response also dealt with a number of Rubenstein’s other rejoinders. R.J. Julia Bookstore owner Roxanne J. Coady addressed the controversy in an email to The Argus, and submitted a Letter to the Editor in the paper. While USLAC wrote that they appreciated the willingness of R.J. Julia representatives and University administrators to meet with students, they also reaffirmed their commitment to organizing in support of Broad Street workers until their demands are met. As students dispersed from the protest, many of whom were chanting “We’ll be back,” the words of one first-year student captured the mood of student activists. Would it be possible to hear from the actual employees of Broad Street Books that were denied the jobs with RJ Julia that the students think that they should have had? I think that would be helpful to get the true facts. Lauren Rubenstein is a subordinate mouthpiece who would follow the company line if Michael Roth assaulted someone in broad daylight.